The new blog template doesn't add the date we make a post, so I've added it to the title. Rich tried to use a blog template outside of Blogger and now he can't change it. We may just wind up scrapping this blog and starting anew, or not. Last weekend my dad and his girlfriend, Bobbi were here for 24 hours. It was a nice but quick visit. We had a great sushi lunch at Sushi Sasa. It's a pretty trendy place downtown. After lunch we went over to the barn so they could meet Little Horse and watch me ride. 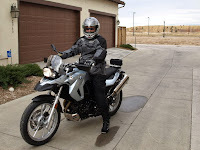 It was a quick ride since it was pretty warm in the sun (81 degrees) and everyone was getting hot, especially LH, who's sporting her winter coat. She was pretty miserable to be working in the heat. I can't say that I blame her. After a bit of relaxing at home, we went for an early dinner at The Flagstaff House in the foothills of Boulder. We got there at 5-ish, which turned out to be a perfect time. It was daylight when we got there, but turned dark during the time we had dinner. The scenery was spectacular! We had a fabulous dinner with some excellent wine that my dad picked out. The next morning we made breakfast, then took dad & Bobbi to the airport. This weekend was a boys/girls weekend. On Saturday Rich scooted with David on his new big yellow motorcycle. 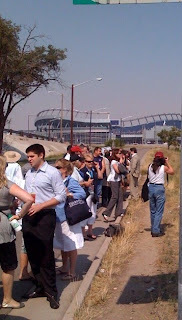 It sounds like they went all over Denver, covering close to 50 miles. I trailered Little Horse over to my old barn where I went on a trail ride with my friend, Mary Jo and her 3 year old Saddlebred mare, Scarlett, or "Ms. Scarlett" as she's known. Since Ms. Scarlett is still new to being ridden, so we kept things at a walk. Little Horse was very accommodating, even doing a "courtesy spook" when Scarlett spooked so she wouldn't feel silly by spooking alone. We were out for close to 2 hours and had a great time. Afterwards, Mary Jo wanted to show me a Mexican restaurant she'd recently discovered, El Pelicano in Aurora. On Sunday I went for a 3 hour trail ride with Aliza (David's wife). It started out cold and windy, with temps in the upper 40's. By the time we were 1/2 way through the sun came out, the wind died down, and it got up to 62. We rode over to Mary Jo's barn where they were having a horse costume contest. That was really cool to see! I should have taken pictures, but I didn't. On the long dirt road on our way home, we let our horses run. Little Horse was going so fast that it was scary fun! While we were riding, the boys were mountain biking in the foothills at White Ranch. They called us when they got done, so we all met up for a Korean lunch/dinner (it was 3pm by now). It was a great weekend! Last Gymkhana of the Year! On Saturday Rich (my official photographer), Little Horse and I loaded up the truck & horse trailer to head over to the Coal Creek arena (5 miles away) for the last gymkhana of the year, put on by the Aurora Horsemen's Association. This one wouldn't have happened, except it was a make-up date for a rain out 2 weeks ago. Normally I don't go to gymkhanas there because they don't start until 4pm and can go until 8pm, which means a loonnngg time in the hot sun. This time there was no hot sun, but the threat of rain, and the small number of people made thing go much quicker than before. Because of the threat of rain, I only signed up to do barrels and in-line barrels. In-line barrels is a line of 3 barrels that you weave in & out of. Since the barrels were arranged in the "normal" pattern, Little Horse could get used to them during our 1/2 hour warm up. She's used to blue or black barrels, but there were 2 white ones. That can be scary! So we spent the majority of the warm up getting used to the scary white barrels. Our next event was in-line barrels. But before our turn it started to rain. It wasn't a downpour, but the wind kicked up, so there was blowing rain & dust. Little Horse showed me what horses do and turned our butts to it. 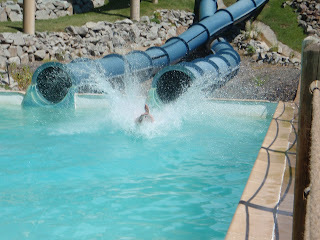 I have to say, rain and wind on the back was better than full-on in the face. After we waited our turn, it was time for in-line barrels. 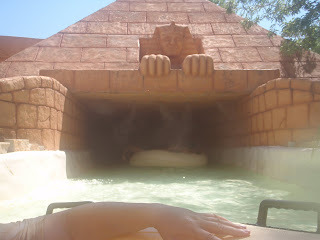 But they changed everything around, so the white barrels were totally scary again!!! The first two were white, so she shied away from them, then she carved the final (blue) barrel. When I turned her to run back to the gate, I could momentarily feel her coil like a spring, then she shot forward, at a full gallop! I could barely get her turned so we didn't run into the gate. Our time for that event was 22 seconds, good enough for 3rd place. A Hard to Beat Weekend! Last week the Denver Athletic club had it's kick-off the season squash tournament. I signed up for two divisions; 40+ and beginner open. I got knocked out of the 40+ group in the first round. However, I made it to the finals in the beginner group! The finals were Friday evening and before a wild crowd of 5 or 6 , I won, 3-1! Scores were 9-1, 9-5, 7-9, 9-5, so it was pretty close the whole time! Since I was on the motorcycle range all day Saturday and Sunday, Laura took advantage of the fabulous fall weather to ride little horse. On Saturday, she went to Longmont to practice chasing cows. Then, on Sunday, she and her friend Aliza loaded up their horses in the trailer and did a three hour ride at the Chatfield recreation area in the foothills south of Golden. Finally, to cap it all off, I'll be starting a new job on Monday! But, I'll save that for another post. I didn't hear the actual rider count, but based on these pics I'm guessing somewhere between 60-75 scooters took part in the ride. Laura and I were just about in the middle of the pack, the first pic is looking forward, the next looking back; As you can see, it was a long line of scooters. 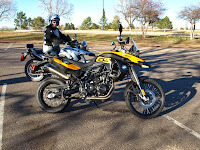 The ride was about 3 hours (including stops) and covered about 50 miles all around Denver. After the ride there was BBQ and a live band, a great way to finish up a fantastic day of riding! I took lot's of pictures throughout the day, you can go to our Smug Mug Gallery to see them all. Snuggles Makes a New Friend! Laura and I were Scoot'n around our neighborhood last week when we came across a lady walking a dog and a cockatoo; You don't see that very often, so we stopped to chat. After talking for a while we decided our 'toos should meet up. Here is Snuggy meeting Monty for the fist time. Monty was inquisitive and Snuggy was stand-offish (as usual). Despite the fact that Monty is quite a bit bigger then Snuggles, they were on Snuggy's turf, so Snug was the dominate too. I don't know if Snug is interested in seeing Monty again, but we're looking forward to hanging out with Kelly and her husband Jeremy sometime in the near future. Since acquiring my 'scoot', back in May, I've been bitten by the two wheel bug really, no, REALLY bad! We love exploring downtown with the scoots without having to worry about parking(both spaces and cost), as we can park them anywhere you park a regular bicycle. 90+MPG helps too and has us both using our car/truck a lot less. In fact, I've gone from filling the Subaru up weekly to once every 2 or 3 weeks (that will change once the snow starts to fly). And, while Laura needs the f-250 to transport the horse around, it's just not practical around downtown. But, I have a need, a need to go 2 wheeling up into the mountains, on those twisty roads and on the freeways! The scoots, even though they'll do 55-60, just are not meant for serious highway travel. 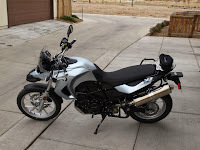 It's the 2009 f 650 GS; A 'dual sport' bike meant for urban commuting and 'light' off road use like dirt and fire roads that are so prevalent up in the mountains! 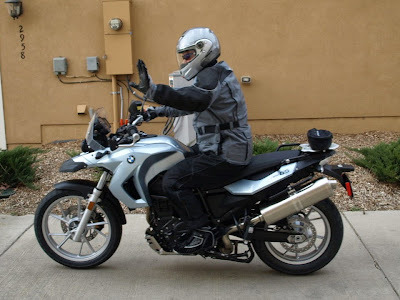 I don't have a lot of experience with 'real' motorcycles, so I'm taking a basic rider course the 3rd week of September to give me the basic info I need to get started and to get my motorcycle endorsement on my driver license. So, I need to start saving my pennies. 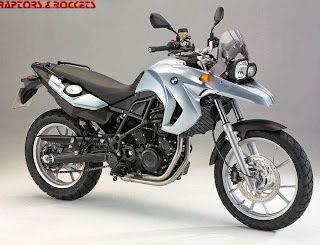 Hopefully, I can get this by next spring. Now the real question....How do I get a rack like the one below?? ....at least as close as I've ever been! 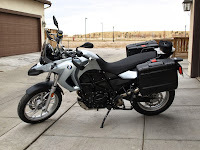 One day after getting the stitches out and being cleared by the doctor, we had scheduled to go up to Salida and bike the Continental Divide, also known as the Monarch Crest trail! 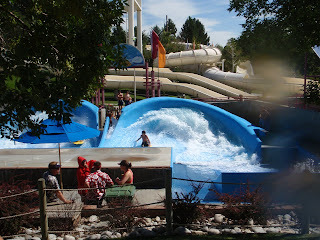 We really love Salida, in the banana belt of the mountains, the weather always seems to be fabulous there! We found these great little cabins along the Arkansas river to stay. The activities around the area are endless; superb biking, hiking, horse back riding, rafting, hot springs and unique little restaurants. We went up with our friends David and Aliza. ...they rented ATV's to ride some of the very same trail we were going to ride but we had nearly 30 miles to go before we would meet up with them! We started at 11,300', but our goal was 12,600; So the trail started out with a 3.5 mile climb to get us to the summit! I've gotten a lot better at climbing at altitude in the past year, but still have a lot of trouble over 10,000'. This is only the second time I have ridden my bike at this elevation. The views all around us were amazing! Here is David making his way towards the summit. Almost there! That peak just to my left at 12,600'. The landscape up that high isn't much more then granite. The sun was intensely hot but we had a very cold stiff wind I guess had to be over 20 mph! We spent the next 12 miles going in and out of the treeline between 10,000 and 12,000 feet. The terrain kept changing from the open, rocky area you see here to dense, twisty forest with pine needle lined trail. It for a fantastic bike ride with a little bit of everything thrown in to keep you on your toes! 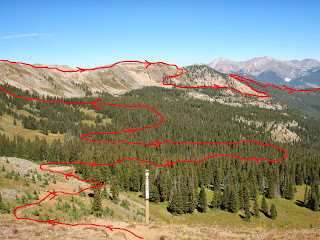 Here is a poorly drawn graphic of our general path in and out of the treeline as we made our way back down from the summit. We made our decent along, and sometimes in, the Silver creek. Near the end of the ride, a blazing fast 5 mile 4X4 road(I saw 32 mph on the computer) back into town, we ran into these 2 crazy girls on quads! We knew they would riding some of the same trail, but we never figured we'd actually run into them out there! We finished the day with a fabulous dinner at the Laughing Ladies in downtown Salida, and a long hot tub. 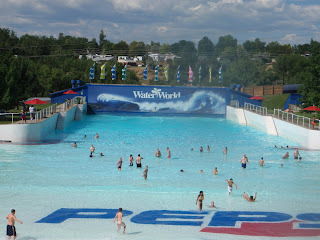 This was my first big epic ride, nearly 5 hours, since we moved here....and I can't wait to do another one! There has not been a lot to post lately! A few days before the DNC started here, I took a pretty serious spill over the handlebars of my mountain bike, cutting open my left shin. The gash was big enough to lay your thumb into, and a little longer then the typical thumb(I'll spare you any pictures)! Besides the 18 stitches in my shin, I had a huge egg sized knot on my calf, behind the cut,(from the bike crashing down on top of me I'm sure) that made it nearly impossible to walk for 5 days. So, the labor day holiday was a pretty quite one around here. We did manage to 'scoot' downtown to the Taste of Colorado for some tasty treats and good music! We were treated to a free concert by John Waite (Babies in the 70's, solo artist 80's, Bad English 90's). Rich Can Ride a Horse too! Last weekend it hit 101 both Saturday and Sunday in downtown Denver. 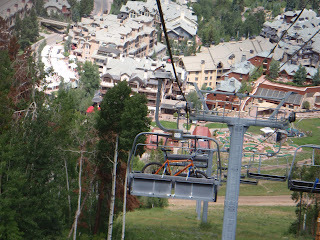 Laura and I wanted to escape the heat, so we drove up to Beaver Creek ski area. Neither one of us had ever been to Beaver Creek in the summer. We'd only been there in the winter for skiing. The place looks a lot different in the summer. The lifts were running hikers and bikers up to the top. Man, I wished I had brought my bike! We're talking about going back next weekend with some friends to do some downhill biking! This time, however, we came to ride horses. After hanging out in the village during the day, we decided to do an early evening dinner at Beano's Cabin. During ski season, you take a horse drawn sleigh up the mountain to the cabin. Today we were taking a 45 minute horse ride up to the top where a fabulous dinner awaited us. Laura had been to Beano's, on a family ski trip, quite a few years ago. So, she knew we were in for a great meal! The plan was to spend Saturday night in Eagle (WAY less expensive then staying in BC!) and get an early start, Sunday morning, to the 4 Eagle Ranch, where we were going to do a cattle drive. Laura, myself and our "wrangler" Hannah had the job of finding the cattle herd (somewhere out on 500+ acres) and getting the group of 50 head back to the ranch where they would be checked out. It took us about an hour to find the herd up on top of a mesa sunning themselves. Most were laying down and not too happy to see us! Our first priority was to get them all up and headed into the general direction of the ranch. Hannah is supervising me grouping the herd together! Below, is my view from the cockpit as I trot the stragglers to keep up with the rest of the herd. Laura guides the herd towards a watering hole, before moving them towards the ranch. Hannah got this shot of us as we waited for the herd to get their drinks in before making our final push to the holding pen. The cattle drive was a great experience! 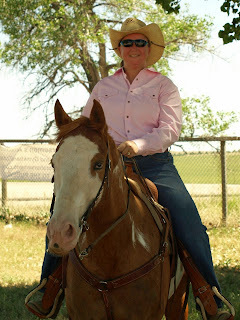 With Laura's help(remember, she took a herding clinic back in June) I almost looked like I knew what I was doing. She used plates and salt and pepper shakers, back at Beano's, to demonstrate how to approach the herd and individual cattle to get them to move the way you want. The tips worked like a charm too! Stay tuned for downhill mountain biking from Beaver Creek, next weekend.